Speechcraft is a short program for community or corporate groups. Within a few weeks you will develop your public speaking ability. and more. You will gain confidence in all all aspects of communication, including prepared and impromptu speeches, audio-visual aids, body language, active listening, and critical evaluation. Your course coordinator and presenters are accomplished Toastmasters who present the fundamentals of public speaking and effective communication in a relaxed atmosphere similar to their own Toastmasters Club environment. 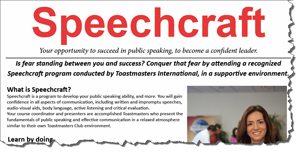 To download Speechcraft pamphlet click HERE. The Annapolis Valley Toastmasters Club serves 14 Wing Greenwood personnel and members of the Annapolis Valley community in Nova Scotia, Canada. We have members from as far away as Annapolis Royal and Berwick, of all ages and background experiences. Our meetings are educational and fun. Guests are always welcome. Join us for a great evening of entertainment. We supply complimentary, skilled speakers to talk on worthwhile causes, and help organizations in need of speakers -- to entertain, inform, motivate and inspire. We can also supply speech contest judges, parade announcers, banquet Toastmasters, masters of ceremonies, consulting and training. Looking for a free speaker? Click HERE. The place to improve your communication and leadership skills.